Weekend Box Office: God said to Noah, "There's gonna be some money money"
After weighing all the various Noah-related puns they might begat this weekend, audiences went with “Noah floods theaters”—rather than, say, “Noah sinks,” “Noah drowns,” or “Drunk, naked Noah flops in his tent”—marching two-by-two to see Darren Aronofsky’s biblical epic and keep their covenant with faith-based and disaster movies. 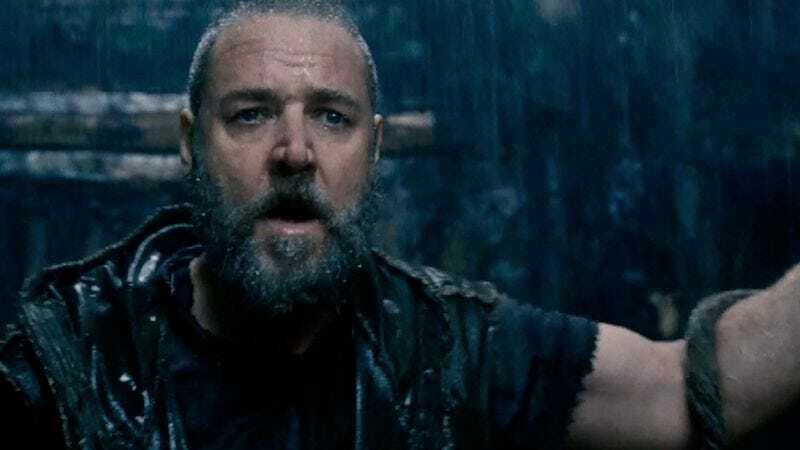 The film opened in first place with $44 million (or, if our Bible math is correct, approximately 4,000 cubits), making for Russell Crowe’s biggest debut ever, and enough to earn more than all of Aronofksy’s first four films combined. It’s still not enough to convince certain religious skeptics—like Faith-Driven Consumer, which today sent out a press release gloating that Noah had clearly “underperformed” by not matching the $84 million opening of The Passion Of The Christ. But for those for whom facts trump their beliefs, Noah is a success. The weekend’s other big story of another very old man, whose survival against incredible odds similarly tests the bounds of belief, didn’t fare nearly as well. Arnold Schwarzenegger’s Sabotage debuted at seventh place with a humiliating $5.3 million, making for his lowest opening, as Box Office Mojo notes, since 1985’s abysmal Red Sonja—a movie that, nevertheless, remains a lot more fun to get drunk to than Sabotage will ever be. With the comparably low receipts for The Last Stand and Escape Plan, it would seem increasingly clear that audiences have finally reached their threshold with buying the 66-year-old as an action star, or buying an Austrian tree trunk as an undercover police officer. Some leaps of faith are simply too great. Acolytes of Cesar Chavez helped drive his own hagiography to twelfth place with $3 million, while the cult surrounding Indonesian action film The Raid 2 gave it a solid $177,700 debut in just seven theaters. The similarly devoted following behind The National flocked to see the band’s sort-of-tour documentary Mistaken For Strangers in just nine theaters, netting it $81,800. But nothing compares to modern religion that is the worship of Frozen: With its Japanese debut, it’s officially passed Toy Story 3 to become the highest-grossing animated film ever and land in the Top 10 movies of all time. Noah may have won the weekend, but when it comes to the ages, audiences vastly prefer their worlds covered in solid water.